something died in our drain spout. how winter razes the shoals of heaven. in it. I know what mercy is and isn’t. ticking crickets, the pulse in my wrist. From What Matters (Welcome Rain Publishers, 2011). Adele Kenny is the author of 24 books (poetry & nonfiction). Her poems, reviews, and articles have been published in journals in the U.S. and abroad and in several anthologies. She is the recipient of various awards and fellowships from the NJ State Arts Council, and her new collection of poems, What Matters, is just out. 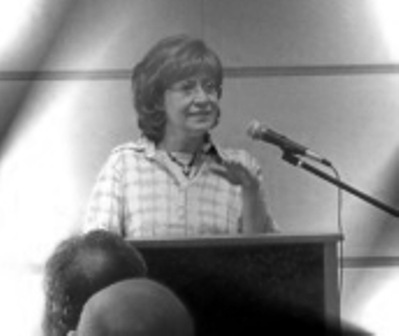 Adele maintains an active schedule of readings and workshops, directs the Carriage House Poetry Series she founded in 1998, and serves as poetry editor of Tiferet. An animal lover, she has raised three Yorkshire Terriers (Dylan, Yeats, and Bijou), and numerous exotic birds. To learn more about Adele, or to receive her weekly poetry prompts, visit http://adelekenny.blogspot.com/ or http://www.adelekenny.com/. I'm with Anjie. That is the line that stays with me: "I kow what mercy is and isn't." Thank you for What Matters. Amen, amen, amen! Adele, this is just fabulous. I LOVE this poem. Especially the line, "I know what mercy is and isn't." A gorgeous poem -- so many arresting lines, though I think I will carry with me from now on, "knowing (as a child knows)/ how much life matters." Thank-you. Painfully beautiful and very true! Me too! This poem is a heartening poem. This is a beautiful poem, Adele! Congratulations to you, dear friend, both for this posting and for your new book. I, too, know the feeling of celebrating being "still here" with days "measured by memory." Thank you!